At the firm of Lawrence & Associates in Fort Mitchell, Kentucky, we fight for the rights of people who have suffered serious injuries and the families of fatal accident victims. We work tirelessly to help our clients get compensation and deal with the medical, financial and emotional effects of serious accidents. We will supply as many details as possible while still respecting our clients need for privacy. While our client was staying at a hotel, he was attacked. The attack severely injured the client’s neck. Hotel employees witnessed the attack, but did not want to get involved. The owner of the hotel denied responsibility for the injury, and refused to pay for the client’s surgery. Lawrence & Associates filed a lawsuit against the hotel to enable our client to get surgery. Lawrence & Associates obtained a recovery for our client and he was able to get all the necessary medical treatment he needed. Our client was in a car wreck when the person behind him failed to stop and rear ended his vehicle. Adding insult to injury, the police officer that responded to the scene got his notes from two different wrecks mixed up, so the police report was incorrect. This caused our client some major heartburn as they dealt with their insurance carrier. Lawrence & Associates tracked down witnesses to the accident. We also found the police officer and got to the bottom of the faulty police report. We presented the proof of what really happened to our clients insurance carrier so that their coverage couldn’t be denied any longer. Lawrence & Associates were able to resolve this case without filing a lawsuit. Our clients car was fixed and his medical bills were paid, plus he was able to set aside some money for future needs. Our client had another attorney for her car accident, but he was not returning her phone calls. She was hurt and was almost kicked out of the court system, but deserved compensation. Lawrence & Associates took over her case in time to save it from being dismissed, fought the defense attorney until it was clear that our client’s case would no longer be a pushover, and negotiated a settlement. Not only did the client get a settlement she was happy with, but Lawrence & Associates also helped her negotiate down the bills she owed to her doctors. Our client had severe crushing injuries after a collision between construction equipment. The client was hospitalized with no income, and no way to pay for multiple surgeries because the insurance company would not approve them. The client’s spouse and children were in danger of losing their home. Lawrence & Associates filed suit against the manufacturer of the equipment involved in the wreck due to defects in the machine that caused it to crush the client. We also took on the insurance company to show it was responsible for paying for all the medical treatment that had been denied. Finally, we contacted the creditors to stop the lawsuits they were threatening to file against our client. Lawrence & Associates obtained a large recovery for our client to replace all lost income, pay for future medical care, and compensate our client for pain and suffering. Lawrence & Associates also forced the insurance company to pay for every single medical treatment they had wrongfully denied. Finally, we were able to save our client’s home from foreclosure. If you or someone you know is struggling like the client mentioned above, call Lawrence & Associates today. 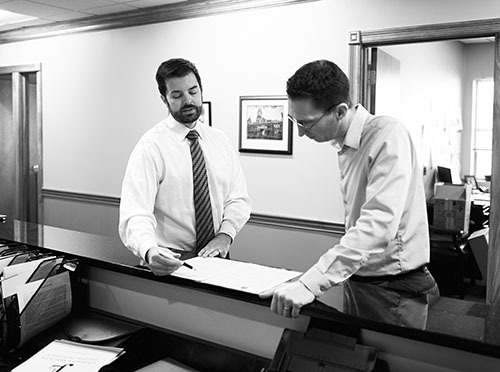 At the firm of Lawrence & Associates in Fort Mitchell, Kentucky and West Chester, Ohio, we fight for the rights of people who have suffered serious injuries and the families of fatal accident victims. We work tirelessly to help our clients get compensation and deal with the medical, financial and emotional effects of serious accidents. We will supply as many details as possible while still respecting our clients need for privacy. Our client was seriously hurt when he fell through the floor of the construction platform. The platform had been provided to his employer by another company, but was not constructed correctly. Our client had a major spine injury and needed surgery. Our client filed a lawsuit against the company that provided the work platform because the platform violated OSHA and caused our clients injury. Lawrence & Associates fought the work platform company for four years, all the way up to the Sixth Circuit Court of Appeals (one step below the US Supreme Court) before finally reaching a settlement. Our client got his spinal surgery and money to replace his lost income. He also had money set aside for future medical treatment. All his past medical bills were paid by the work platform company. Our client was involved in a wreck on the interstate while driving through Kentucky. Because of the wreck, the client was unable to begin work on a new construction contract outside the country. The other driver’s insurance company refused to reimburse the client for the loss of income. Lawrence & Associates filed a lawsuit against the other driver and got proof of the lost income from the company that awarded the construction contract. Lawrence & Associates recovered for our client’s lost income and got the property damage for his vehicle paid in full. Lawrence & Associates Help a Client Who Slipped on Liquid in a Store Get Payment for Medical Bills, Pain, and Suffering! At the firm of Lawrence & Associates in Fort Mitchell, Kentucky, we fight for the rights of people who have suffered serious injuries and the families of fatal accident victims. We work tirelessly to help our clients get compensation and deal with the medical, financial and emotional effects of serious accidents. We want to share with you the results of a case we oversaw in September of 2011. We will supply as many details as possible while still respecting our clients need for privacy. Our client was shopping and slipped in liquid on the floor of the store. Our client severely broke their arm. After investigation, it appeared the store’s equipment malfunctioned and leaked fluid onto the floor. The store denied liability. Lawrence & Associates challenged the store and showed proof that the fall was due to its faulty equipment. Lawrence & Associates was able to recover the client’s medical bills plus more for pain and suffering. The client was pleased to recover without having to file a lawsuit! Lawrence & Associates Helps a Client in a Car Accident Get a Settlement For His Surgery, Time Off Work, and Pain and Suffering! Our client was in a motor vehicle accident in November 2011. The other driver failed to yield the right of way and hit the left rear of of our client’s vehicle. A few days after the accident, our client developed numbness and tingling in his arm and severe jaw pain. He was 58 years old at the time of the accident and had been diagnosed with rheumatoid arthritis. Our client’s numbness was diagnosed as carpal tunnel syndrome, which his doctor thought came from clenching the steering wheel when the collision occurred. The doctor also said the jaw pain was related to the impact. Our client initially came to Lawrence & Associates because he had no way to get the medical treatment he needed. Lawrence & Associates was able to get him the surgery his doctor recommended, which was fully paid for by the other driver’s insurance company. Our client also got paid for his time off work and for his pain and suffering. Our client was in a motor vehicle accident in September 2011 when another driver ran a stop sign and T-boned her vehicle. Our client suffered low back pain and her doctor recommended surgery that our client was unable to go through because of her work schedule. She went to physical therapy instead but knew she was going to need surgery at some point in the future. The insurance company wouldn’t pay for a surgery that hadn’t happened yet, and our client needed help. Lawrence & Associates got our client a settlement that not only paid for the physical therapy medical bills, but also contained extra money to be used for the future surgery. The other driver’s carrier was forced to compensate our client without hiding behind frivolous defenses. At the firm of Lawrence & Associates in Fort Mitchell, Kentucky, we fight for the rights of people who have suffered serious injuries and the families of fatal accident victims. We work tirelessly to help our clients get compensation and deal with the medical, financial and emotional effects of serious accidents. We want to share with you the results of a case we oversaw in July 2013. We will supply as many details as possible while still respecting our clients need for privacy. Our client was traveling from Miami to Chicago by bus when the bus he was on had to make a sudden stop and ran off the road in Northern Kentucky. Since the wreck happened in Northern Kentucky, our client was forced to file a claim in a Kentucky court as well. The bus company’s insurance carrier did not believe that our client was injured in the wreck. Our client had been asleep when the wreck happened and was thrown into the air. He landed on an armrest on his lower back, which caused his injuries, including a disc bulge in his spinal column. Lawrence & Associates was able to prove the injury was related to the bus wreck and forced the company’s insurance carrier to pay our client for his medical treatment and pain and suffering without him ever having to return to Kentucky or file a lawsuit. Contact us at (513) 351-5997 to speak with an attorney.